'Ransomware' is a type of malware that attempts to extort money from a computer user by infecting and taking control of the victim's machine, or the files or documents stored on it. Typically, the ransomware will either 'lock' the computer to prevent normal usage or encrypt the documents and files on it to prevent access to the saved data. 2. What is ransomware? • 'Ransomware' is a type of malware that attempts to extort money from a computer user by infecting and taking control of the victim's machine, or the files or documents stored on it. • Typically, the ransomware will either 'lock' the computer to prevent normal usage, or encrypt the documents and files on it to prevent access to the saved data. 3. History • The first known ransomware was the 1989 "AIDS" trojan (also known as "PC Cyborg") written by Joseph Popp. 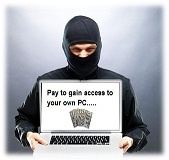 • Extortionate ransomware became prominent in May 2005. • By mid-2006, worms such as Gpcode, TROJ.RANSOM.A, Archiveus, Krotten, Cryzip, and MayArchive began utilizing more sophisticated RSA encryption schemes, with ever-increasing key-sizes. • In 2011, a ransomware worm imitating the Windows Product Activation notice surfaced. • In February 2013, a ransomware worm based off the Stamp.EK exploit kit surfaced. • In July 2013, an OS X-specific ransomware worm surfaced. • CryptoLocker has raked in around 5 million dollars in the last 4 months of 2013. 4. How do criminals install ransomware? • Ransomware generates a pop-up window, webpage, or email warning from what looks like an official authority. • Ransomware is usually installed when you open A malicious email attachment Click a malicious link in an email message an instant message on social networking site • Ransomware can even be installed when you visit a malicious website. 6. Encryption Ransomware • Encrypts personal files/folders (e.g., the contents of your My Documents folder - documents, spreadsheets, pictures, videos). • Files are deleted once they are encrypted and generally there is a text file in the same folder as the now-inaccessible files with instructions for payment. • You may see a lock screen but not all variants show one. • Instead you may only notice a problem when you attempt to open your files. • This type is also called 'file encryptor' ransomware. 7. Lock Screen Ransomware • 'Locks' the screen and demands payment. • Presents a full screen image that blocks all other windows. • This type is called 'WinLocker' ransomware. • No personal files are encrypted. 8. Master Boot Record (MBR) Ransomware • The Master Boot Record (MBR) is a section of the computer's hard drive that allows the operating system to boot up. • MBR ransomware changes the computer's MBR so the normal boot process is interrupted. • A ransom demand is displayed on screen instead. 9. Reveton • In 2012, a major ransomware worm known as Reveton began to spread. • It is also known as "police trojan". • Its payload displays a warning purportedly from a law enforcement agency. • claiming that the computer had been used for illegal activities, such as downloading pirated software, promoting terrorism, copyright etc. • The warning informs the user that to unlock their system they would have to pay a fine. • To increase the illusion that the computer is being tracked by law enforcement, the screen also displays the computer's IP address and footage from a computer's webcam. 10. CryptoLocker • A Encrypting ransomware reappeared in 2013. • Distributed either as an attachment to a malicious e-mail or as a drive-by download. • encrypts certain types of files stored on local and mounted network drives using RSA public-key cryptography. • The private key stored only on the malware's control servers. • Offers to decrypt the data if a payment (through either Bitcoin or a pre-paid voucher) is made by a stated deadline. • threatens to delete the private key if the deadline passes. • If the deadline is not met, the malware offers to decrypt data via an online service provided by the malware's operators, for a significantly higher price in Bitcoin. 12. Cont.. • Download Microsoft Security Essentials, which is free, or use another reputable antivirus and anti-malware program. • If you run Windows 8 or Windows RT, you don’t need Microsoft Security Essentials. • Scan your computer with the Microsoft Safety Scanner. • Keep your browser clean. • Always have a good backup system in place, just in case your PC does become infected and you can’t recover your files. 15. Removal – Other Anti-Malware Programs 1. Start your computer in “Safe Mode with Networking”. 2. Stop and clean malicious running processes. • Download and save "RogueKiller" utility on your computer'* (e.g. your Desktop). • Double Click to run RogueKiller. • Let the prescan to complete and then press on "Scan" button to perform a full scan. • When the full scan is completed, press the "Delete" button to remove all malicious items found. • Close RogueKiller and proceed to the next Step. 16. Clean Remaining Malicious Threats • Download and install a reliable FREE/Pro anti malware programs to clean your computer from remaining malicious threats. E.g. Malwarebytes Anti-Malware, Norton etc. • Run "Anti-Malware" and allow the program to update to it's latest version and malicious database if needed. • let the program scan your system for threats. • Select all threats in result scan and remove all. • When the removal of infected objects process is complete, "Restart your system to remove all active threats properly“. 19. File Restore- Shadow Copies 1. Navigate to the folder or the file that you want to restore in a previous state and right-click on it. 2. From the drop-down menu select “Restore Previous Versions”. * Notice* for Windows XP users: Select “Properties” and then the “Previous Versions” tab. 3. Then choose a particular version of folder or file and the press the: • “Open” button to view the contents of that folder/file. • “Copy” to copy this folder/file to another location on your computer (e.g. you external hard drive). • “Restore” to restore the folder file to the same location and replace the existing one. 21. For Urausy, delete the "shell" registry value from HKEY_CURRENT_USERSoftwareMicrosoftWindowsNTCurrentVersionWinlogon ONLY IF these two conditions are met: 1. The "shell" registry value is located under HKEY_CURRENT_USER and Not “ HKEY_LOCAL_MACHINE”. WARNING! Deleting the "shell" value if it is listed under HKEY_LOCAL_MACHINE may break the Windows system. 2. There is a reference to a .dat file (e.g. skype.dat) in the value data. • Reboot the system again, this time into Normal mode. • Finally, run a full computer scan to repair any remaining files. 22. Conclusion When it comes to malware attacks, knowledge is the best possible weapon to prevent them. Be careful what you click!! Preventive measures should be taken before ransomewares establish strong hold. Keeping all the software updated and getting latest security updates might help to prevent the attacks. Use of antivirus and original software is highly recommended. Creating software restriction policy is the best tool to prevent a Cryptolocker infection in the first place in networks.